Having achieved major success in the UK insurance market, non-standard insurance website QuoteRack.com is being launched in the US. QuoteRack.com offers an online connection between consumers seeking insurance quotes for niche and non-standard types of insurance or financial service and those insurance agents and mortgage brokers who specialise in these types of financial products. Unlike most other insurance websites, we operate on a subscription basis rather than on a pay-per-lead basis. Offering website visitors a choice from over 100 different types of personal, commercial and life insurance quotes plus mortgages and loans, following its launch QuoteRack.com will target some of the more unusual types of insurance and finance for which most insurance websites cannot cater, including Auto insurance, Property insurance, Healthcare insurance and Life insurance. Full details of the available Insurance quotes from QuoteRack.com. QuoteRack.com Sales Director Peter Skinner confirms the website will operate on a State-by-State basis: "We know that most consumers would prefer to deal with insurance and finance experts who are local to them and QuoteRack.com will provide just that" says Skinner. "We are handling enquiries from insurance agents across the US who are interested in responding to insurance enquiries generated from within their own State." QuoteRack.com is offering each Insurance Agent an exclusive, State-wide arrangement in respect of those consumer enquiries generated for their selected categories of insurance or finance. "For our supporting agents, it's a great deal" says Skinner. "Unlike most other insurance websites, we operate on a subscription basis rather than on a pay-per-lead basis." 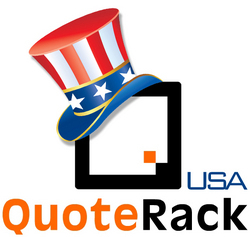 QuoteRack.com will be available online from May 1st 2009.